Greenwich is arguably London’s most beautiful quarter, with a very present maritime and naval heritage that can be witnessed in all the pubs, museums and roadsides along the way. There’s something for everyone here, from the Maritime Museum to the observatory on the top of the hill in Greenwich Park where the Meridian was established to Greenwich Market, or the park with spectacular views of London. And that’s not to mention the Cutty Sark, which recently reopened after being devastated by a fire. You could even catch a play at the highly respected Greenwich Theatre or visit the Fan Museum; a small, boutique gallery dedicated to the humble fan. But for out must-do activity, we’d suggest taking in some world-class jazz at Oliver’s Music Bar on Spread Eagle Yard. It’s tucked away underground like an old speakeasy and can be easy to miss, but it’s a fun little hideaway you’ll want to visit again and again. Note to romantics: if you’ve just done some wining and dining at one of Greenwich’s many phenomenal restaurants (or had afternoon tea at the Orangery; booking imperative), then you’d be well-advised to continue wining at Oliver’s well into the wee small hours. After the last tube, however, transport can be troublesome. The 188 bus will take you back into town and runs all night, however. All the visitor attractions in Greenwich are within easy walking distance of each other, which makes the area easy to explore. The below itinerary has a selection of some of the best things to see in Greenwich. 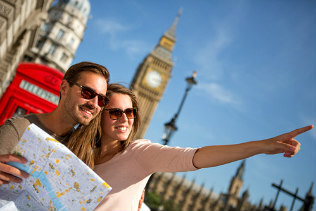 Make sure you use our Greenwich hotel booking service too, to book an affordable place to stay! This is the fantastic O2 Arena. It’s a huge entertainment district including an indoor arena, a music club, a cinema, an exhibition space and bars and restaurants. This was formerly known as the Millennium Dome and the Greenwich Millennium Village is an urban regeneration just to the south of here. You’re now at the Trinity Hospital almshouse. It was founded in 1613 and is the oldest surviving building in the centre of Greenwich. Here, in front of the north-west corner of the Hospital is an obelisk erected in memory of Arctic explorer Joseph René Bellot, known as The Bellot Memorial. The Cutty Sark is a clipper ship that was built in 1869 and has been preserved in this dry dock. She served as a merchant vessel and was the last clipper to be built for that purpose. A major fire in May 2007 destroyed a part of the ship and while the Cutty Sark Conservation Project is underway, there’s no access to the ship for the public. But there’s a small souvenir shop adjacent to the conservation site, and here you can view the ship and the conservation work via a large observation window. This is a fantastic comedy club called Up the Creek. It plays host to some of the UK’s best comedians and there’s a disco once the comedy’s over - so it’s a whole night’s entertainment under one roof! On Creek Road itself you’ll find exciting shops where you can buy fantastic retro and kitsch goods, or pick up that must have vintage outfit. You can even select a luxury accessory for your four legged friend! The Old Royal Naval College and more..
Sir Christopher Wren's domed masterpiece at the centre of the heritage site in Greenwich is The Old Royal Naval College. Several of the buildings are let to the University of Greenwich and the King Charles block is let to Trinity College of Music. Within the complex is the former college dining room and the stunning Painted Hall, by James Thornhill. National Maritime Museum and more..
Make sure you visit the National Maritime Museum. When you’re here you get three fantastic attractions because the museum is made up of three sites: the Maritime Galleries, the Royal Observatory and the Queen's House. Together these constitute one museum that shows the importance of the sea, ships, time and the stars and their relationship with people. This is a must-see venue for any visit to Greenwich! Nearby at the junction of Croom's Hill with Nevada Street, is Greenwich Theatre, one of two Greenwich theatres, the other being the Greenwich Playhouse. The Fan Museum is the only museum in the world devoted entirely to fans and fan making! It’s home to a collection of more than 3,500 predominantly antique fans from around the world dating from the 11th century to the present day. Greenwich Market is full of small shops and boutiques for you to explore and it sells an incredible range of fashions, gifts, books, music, antiques and household ware. Of particular interest are shops selling items that reflect Greenwich’s maritime history and others that showcase the work of local craftsmen. 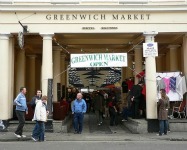 Greenwich Market has had a royal charter since 1700. From cufflinks to kilts to pictures and prints you’ll find it all here. Shopping in Greenwich Town Centre is a breath of fresh air. The historic area is packed with unique shopping opportunities stretching from Royal Hill to Creek Road. It’s popular for shops offering fresh produce and imaginative pubs and restaurants. Greenwich Park is the biggest Royal Park in London and it’s made up of 183 acres! It was laid out in the 17th century and formed from the hunting grounds of the Royal Palace of Placentia. The park rises towards Blackheath and at the top of this hill is a statue of James Wolfe, commander of the British expedition to capture Quebec. The Queen’s House and more..
To the south-west of The Queen’s House (in Greenwich Park) are what’s thought to be early Bronze Age barrows that were re-used by the Saxons in the 6th century as burial grounds. To the east between the Vanbrugh and Maze Hill Gates is the site of a Roman villa or temple. A small area of red paving protected by railings marks the spot. It was excavated in 1902 and 300 coins were found dating from the emperors Claudius and Honorius to the 4th century. Vanbrugh Castle now consists of private flats. It was built by Sir John Vanburgh in the early eighteenth century. Vanbrugh was a dramatist and architect, famous for his design of Blenheim Palace. The Ranger's House and more.. This elegant Georgian villa, at the Blackheath end of the park, is the Ranger’s House. It was built in 1723 and became the official residence of the Ranger of Greenwich Park (from 1815 this post was held by Princess Sophia Matilda, the niece of George III). It remained an aristocratic and then royal home until 1902. Today it houses the Wernher Collection - an astounding display of medieval and Renaissance works of art. Without doubt, Oliver’s Jazz Bar is one of London’s best-kept secrets. As well as being in one of London’s most beautiful boroughs, this music grotto offers some of the best jazz the capital has to offer. It’s a fantastic place to get a drink and hear some jazz, or if you’re looking for something special for a date, this is a great option. The Orangery is a beautiful café restaurant serving afternoon tea as part of the Fan Museum, and brings the best of classical architecture and English tradition to an already stunning venue. You’re required to visit the museum if you want the refreshments part of the tour, which is enlightening and beautiful.